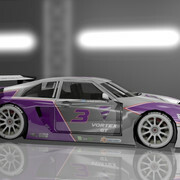 This is a new skin for LS2 - Vortex GT driven by Jaime Martinez regular Speed Dreams driver. Everything made by me is Creative Commons Licensed. It was made representing an Official Team Livery.